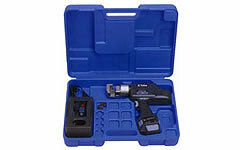 REC-13W Battery Operated Tools: Izumi Products. 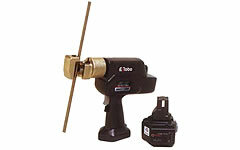 The REC-13W was designed to cut 1/2" threaded rod used for hanging ducts, sprinkler conduits and cable racks commonly used in building construction. The 3/8" hanging rods are secured by using anchors buried into the ceiling. Then it is cut to the length required for the hanging materials. The unit comes with blades for M10" and M12" threaded rod. M12 stainless steel 95 cuts.